Pasta salad is great for summer cookouts and events, but it's also a delicious side dish salad any time of the year! Try one of these flavorful pasta salads with your next cookout or family meal. 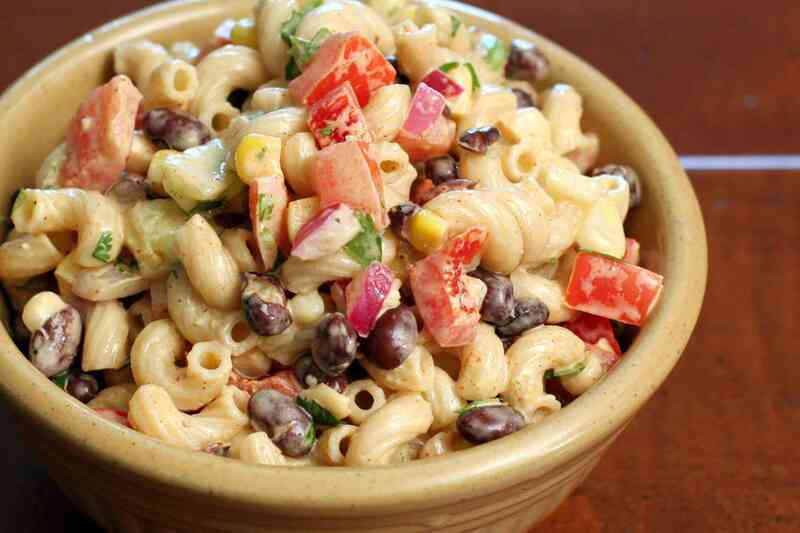 This pasta salad is full of surprises, with Tex-Mex flavors, black beans, corn, and a variety of chopped vegetables. Use macaroni or a similar pasta in the salad. The dressing is a mayonnaise-based mixture with the addition of Southwest seasonings and lime juice. The salad is great with burgers, fajitas, or grilled steaks. A simple mayonnaise dressing flavors this delicious lobster macaroni salad. The lobster is the star of this salad! Diced or shredded cheddar cheese and diced cooked ham are combined with cooked macaroni, bell peppers, and onions, along with a simple mayonnaise dressing. Add cooked fresh or frozen peas if you'd like. This BLT macaroni salad is filled with crumbled bacon and hard-cooked eggs. The salad is mounded on lettuce and tomato slices. Add grilled chicken to make it a hearty main dish salad. This is a flavorful pasta salad, perfect for an everyday lunch with soup, or serve it as a side dish at your next cookout. A combination of mayonnaise, lemon juice, sour cream, garlic, and dill help to flavor this delicious pasta salad. Pesto and lemon juice help to flavor this tasty pasta salad. Add a little diced cooked chicken, shredded or cubed cheese, or ham for a heartier supper salad. This chicken, spinach, and pasta salad is tossed with a flavorful mayonnaise and lemon juice dressing. This is a great main dish salad for hot summer days, or take it along to a potluck or big family cookout. Use cooked leftover chicken or a rotisserie chicken for this tasty salad recipe. This macaroni salad is made with hard-cooked eggs, chopped vegetables, and a seasoned mayonnaise dressing. 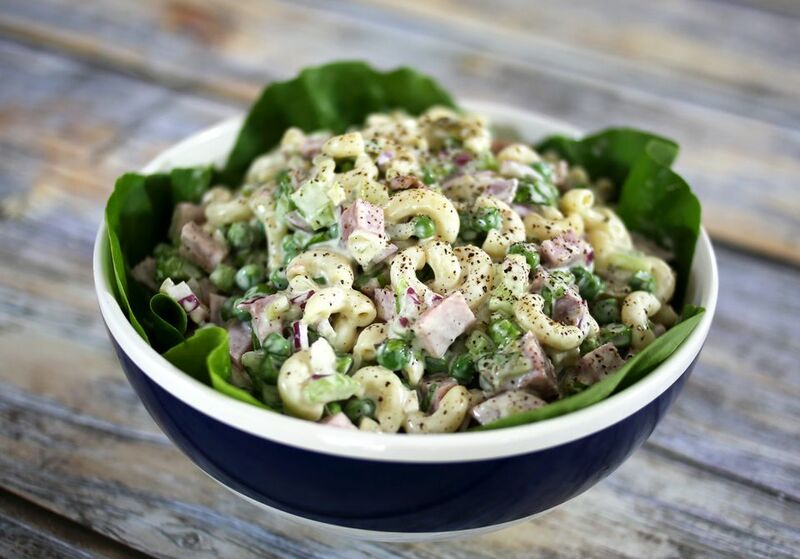 It's a classic macaroni salad with creamy dressing, and always welcome! A creamy mayonnaise and lemon dressing bring pasta, bacon, and chicken together in this flavorful pasta salad. The pasta can be macaroni or mini penne pasta. Vegetables include tomatoes, onion, and herbs. Make this pasta salad with crabmeat, shrimp, or lobster, or use a combination. Or use imitation crab with or without shrimp for a budget-friendly seafood salad. This is one of our favorite pasta salads, and it's surprisingly easy. Use rotini, wheels, shells, or elbows in this tasty shrimp salad. The salad should be refrigerated for a few hours before serving, so plan to prepare it earlier in the day.